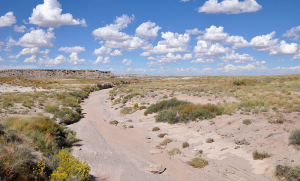 Also known as an arroyo seco, gulch, or gully, a wash is a dry stream or river bed that does not hold water most of the time, but that is subject to seasonal flooding. Washes vary greatly in depth, width and length, and can be found all over the world in semiarid and desert areas. They are common throughout New Mexico and Southwestern parts of the U.S., where prolonged droughts keep them dry and heavy rains make them prone to flash flooding. "Dry Wash in Petrified Forest National Park in Northeastern Arizona, October 3, 2010" by Finetooth is licensed under CC BY-SA. A08 The Ghostway (05-03) p.